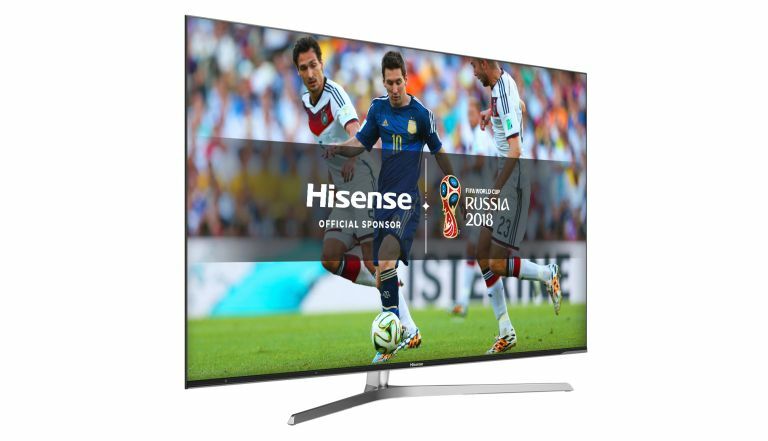 The U7A is a feature-packed 4K UHD LED LCD TV from Hisense, seemingly tailor-made for sports fans. Reflecting the brand’s sponsorship of the FIFA 2018 World Cup, it actually boots with a World Cup Russia logo and can auto detect sports content for optimised picture processing. Thankfully it’s not just about pies, prawn sandwiches and primadonnas though; this TV is a good bet for gamers and movie fans too. The U7A may have an upper budget price tag, but design and finish are a class above. The panel is enviously thin, putting on weight only to accommodate connections, electronics and sound system. The bezel is slim and nicely rounded. Available in 50-, 55- and 65-inch sizes, the panel sits on a substantial V-shaped central pedestal. The set sports four HDCP 2.2 compatible HDMIs, but only two support 4K @ 60Hz, the other pair handling 4K up to 30Hz. There’s also composite AV, an optical digital audio output and two USB ports (one a v3.0 for timeshifting onto an external USB drive), The tuner default is Freeview Play, but there’s also a generic HD satellite option if you’re limited to a dish aerial. Especially given the reasonable, if not quite 'cheap' price of the U7A, image clarity and colour vibrancy are high. The set looks fine with HD, and excellent with native 4K, although choosing the right image preset makes a big difference to its wow factor. Of the SDR image presets, Standard and Dynamic are your best options. While the set has two cinema modes, neither sell the benefits of the panel, being rather flat and dull. With HDR content, these presets default to HDR Dynamic, HDR Day and HDR Night. Here HDR Dynamic wins out. The colder white really helps define 4K detail, adding punch and granular texture to images. The picture is supremely sharp. The U7A supports HDR10 and HLG, although it’s not particularly bright. I measured peak luminance at just under 300 nits in HDR Dynamic mode, using a 5 per cent window. But that doesn’t tell the whole story. A good black level performance really helps boost dynamics. Backlight uniformity is also above average for this class of set. Watching a letterboxed movie, the screen presents dark, even bars, though you should sit square on for maximum contrast and colour. Perhaps the most unusual aspect of the U7A is its Auto-Sport mode. When engaged, this automatically prompts you to switch to the Sport preset when it detects appropriate content. While this trick only works on tuner content, and not anything that comes in via HDMI, it is rather cool. The mode tends to oversaturate primary hues, so pitches always look verdant green. The set boasts effective motion handling. Ultra Smooth Motion processing comes in Standard, Smooth, Film, and Clear strengths. Clear and Standard both get a thumbs up, as they retain detail and minimise judder for motion and panning. A Game mode is available to temper image lag. If you frag using the Standard image preset, lag is close to 50ms. However, with Game mode on, this drops to a less invasive 30ms. Audio quality isn’t half bad, as two rear-mounted woofers help improve the performance of the set’s downward firing stereo speakers. The Hisense Vidaa U smart TV portal is clean and simple, which is a good thing. It may lack some of the functionality offered by LG’s webOS, but it’s a good deal more elegant than the Android TV platform used by Sony. The main home screen is a simple horizontal tile bar from which you can access Freeview Play, Apps, Inputs, Media and Settings. Nothing more, nothing less, but all the streaming services you actually care about are onboard. Netflix, Amazon Prime Video and YouTube will stream 4K, with dedicated fast-access buttons on the IR remote control. Other streaming services include Rakuten TV, Chilli Cinema and the main channel catch-up TV players – BBC iPlayer, etc – which are deftly integrated into the roll-back Freeview Play EPG. No, it doesn’t support 3D. There’s no shortage of competition in the sub-£1000 4K TV sector, particularly from the likes of Philips, Panasonic and LG, but at a launch price of £799 the U7A can be considered very solid value. Its aspirational design aesthetic and unfussy OS belie its price ticket and image quality is cracking. The set may not be a class leader when it comes to HDR peak brightness, but a solid black level and strong colour performance, coupled to some effective motion handling, ensure this sporty UHD screen is consistently entertaining, whoever you support.